There is more to car glass than a windshield, and having to replace any piece of it isn’t any fun, but Glass.net makes an inconvenient task more manageable. Our partner glass shops are Local to your neighborhood and many of them offer auto glass replacement within 24 hours of selecting their service. When it comes to the safety features of your vehicle, your windshield is probably not the first thing that comes to mind. Instead you probably think of your seat belts, airbags, or the frame of your car. It may surprise you to learn that your windshield is actually essential to the functionality of your airbags, and the strength of your car frame. Your windshield can even save you from the serious injuries, and even possible death, that occur when you fail to wear your seat belt, or your seat belt doesn’t work properly. An example of this comes from a news report in May of 2015 from Texas. A 60 year old woman was lodged and became stuck in her windshield after getting into a car accident. While it may seem odd for this to happen–this is precisely what your windshield was made for, in the event that your seat belt is not properly worn when an accident occurs. The purpose of your windshield is multi-faceted, and much more important than you probably know. Outside of your windshield, your car can have up to 5 additional types of car window. The windows in your doors are called sidelites. There are two different types of glass that sidelites can be made out of, which will be covered later in this article. Depending on the type of glass the sidelite is made out of, a series of very precise tools must be used to create the perfect shape for your automobile. This includes diamond wheels, coolant, dressing sticks, diamond belts, silicon carbide belts, cutting wheels, silicon carbide wheels, and diamond pads and files. The small triangular windows that you (usually) can’t open, positioned near the joints of your car, are called quarter windows. Over time, less and less vehicles have quarter windows built into their design. (Even more infamous and rare are the elusive 1970’s opera windows). When quarter windows have hinges and a latch, they’re called ventiplanes–because they can be opened for additional ventilation. These are usually found in minivans and some trucks. Some quarter windows are motorized as well–so people can easily press a button and roll them down. Your rear window is called the backlite. What we know as a rear window today, developed over a few decades. The earliest cars had no windows or car glass of any sort. The windshield glass and sidelites were added for comfort and convenience, but the rear window was either mitigated to a small panel near the top of the car’s cabin, or omitted from the vehicle altogether. By 1930, most cars had rear windows similar to what we see today, as it became apparent that being able to assess other drivers on the road was necessary for safety reasons. Each of these types of windows help to reduce extraneous noise, insulate your vehicle, provide better aerodynamics that improve gas mileage and wind resistance, and help keep the frame of your vehicle from crushing inwards in the event of a rollover accident. In recent years there has been much debate about the switch from using tempered glass for side, quarter, and rear windows, to now using laminated glass. Glass that has been tempered, has undergone a special heat and cooling treatment that makes the glass stronger and shatter resistant. If the glass does shatter, it shatters in a less hazardous pattern that is supposed to reduce the risk of cutting your skin. However, this is not always the case–which is why windshields are no longer made with tempered glass. (In fact, under federal law, all windshields must be made with laminated glass.) Simply put, it’s very difficult to consistently engineer glass that won’t cut you upon shattering. Since most side, back, and quarter windows of a vehicle aren’t likely to be impacted or break during an accident, this was not a primary concern of car manufacturers until the late 2000s. In the late 2000’s car manufacturers began to make the shift to laminate glass for new safety concerns. Primarily, the concern was preventing the passengers inside of a vehicle from forcefully exiting during an accident. Being ejected from your vehicle is usually deadly, if not life-threatening. Your odds of surviving a car accident and having minor to moderate injuries, rather than serious or life threatening injuries, are much higher if you remain in the vehicle. The process of creating laminate glass is more complex than tempered glass. First a series of dry and wet ingredients are combined and heated until they uniformly reach a liquid state, so that they combine and chemically bond. The particular ingredients are selected and combined in order to create a stronger glass that shatters in a non-hazardous pattern. The mixture is then poured into a warm mold, so that it takes the proper shape. After it initially sets, the newly created glass then undergoes hot and cold tempering, to further strengthen the chemical bonds. After 2 sheets of glass are created in this manner, they are then fused together by sandwiching a piece of poly-vinyl butyral between them. This sandwich of glass and PVB is then put into the hot pressure chamber of an autoclave until they are firmly bonded together. This process is vital to creating laminate glass, as it was created with the purpose of preventing the glass from shattering and allowing a passenger to exit the vehicle, in the event of a high impact accident. 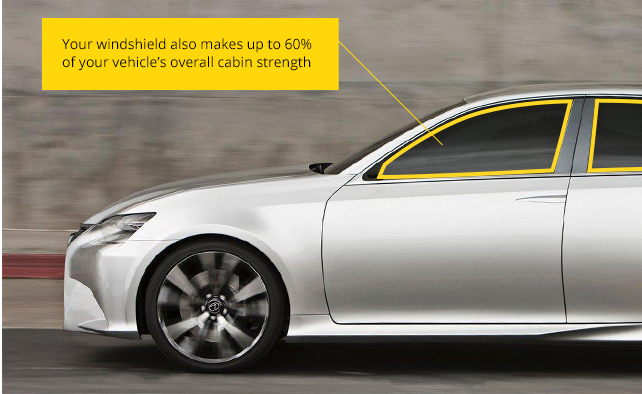 Also, in the case of a rollover, properly installed laminate car glass helps make up a significant percent of the car’s overall cabin strength. This means you are much less likely to be crushed if your car rolls over. However, if for any reason you need to escape from or break into your vehicle, laminate glass is nearly impossible to puncture and shatter successfully. Most car manufacturers believe that since events of escape/emergency break-in are far less likely than a high impact or rollover accident, that the benefits of using laminated glass far outweigh the dangers. Although there has not yet been a legal mandate that requires all car windows and glass to be made with laminated glass, it is still highly likely that all of your car windows are made of laminate glass if you have a newer car. Should I Get Replacement Car Windows, Or Just Repair Them? Damage to your car windows can be a serious danger to you and the passengers of your vehicle. Outside of the inconvenience of poor gas mileage, wasted air conditioning or heat, and/or the excessive cabin noise–your car windows are an important structural component of your vehicle. Which means it’s important to take care of the damage to your car windows as soon as possible. Both types of car window glass are comprised of a grid of molecular bonds. When a portion of that grid has been damaged, the rest of the grid will attempt to compensate–and as a result become weaker as a whole. It’s why many seemingly small cracks seem to end up growing in size practically overnight. Since there was already a small chip in the glass, the glass as a whole was weakened. Temperatures that are too high or too low, driving over a bump at just the right speed, or simply just closing your car door roughly–that weakened glass will simply spider from the point of the original damage. Whether you should get replacement car window or just repair the damage depends on the size and severity of the damage. The faster you get your glass repaired, the better! As long as the damage is minor–smaller than the size of a quarter–you should be able to get it repaired affordably. However, a scratch, pit, or chip that is bigger than the size of a quarter, replacement will be necessary. In the case of broken or shattered glass, car window replacement will also be necessary, no matter how large the damage is. The first step to replacing any piece of car glass in your vehicle, is to start by cleaning up the debris from the damaged glass. It’s dangerous to try to work around tiny pieces of glass that are scattered everywhere. Plus, if the window being replaced needs a new seal to hold the glass in place and support the structure of the car, you don’t want to have anything come between the seal and the car frame, or the new glass. Your installer will use a powerful shop vacuum to clean the cabin, seats, carpet, center console, car frame, and more. Glass has the ability to shatter in a very far-reaching scatter pattern so professional installers will take their time and thoroughly clean the vehicle for safety and installation purposes. After cleaning the broken glass from the frame of your car window, and the inside of your vehicle, the glass installer will begin to remove inner panel of your car door. Inside of the inner door panel the installer will remove the mounting hardware. Depending on your vehicle, removing the hardware inside of the vehicle could include disconnecting the plug that delivers power, multiple layered components, and finicky clips. When removing the inner door panel there are often additional broken glass shards that will need to be removed and/or vacuumed. From there, the new glass is shimmied into place. It’s important that the glass is positioned correctly on the track, or it will grind, scratch, and possibly break when it’s rolled up or down. After the car window glass has been positioned on the track. How your quarter panels are replaced will depend on several different things. First, do the windows hinge or electrically roll open? Or are they just stationary? If they are windows that have hinges or electrically roll open, they will undergo the same replacement process as a sidelite window. The inner panel the quarter window is located in will have to be removed and all the broken glass cleaned out of it. Then the mounting hardware will have to be carefully removed, and the window shimmied carefully into place. Then the mounting hardware is reinstalled, and lastly, the inner panel is also reinstalled. When a quarter window is stationary, it will be replaced much like a windshield. The urethane seal around the window must be carefully and closely cut to the edge of the frame, after the glass of the damaged window has likely been forcefully removed. From there, the frame and the new quarter panel car window glass will be carefully cleaned and marked for mounting. The new urethane seal will be applied to the appropriate surfaces and the glass will be installed in the frame. Lastly, the seal will need time to fully bond to both surfaces, before the vehicle is safe to drive. A rear car window is installed almost identically to a car’s windshield. Again, the window will first be forcibly removed, and the excess glass shards will be thoroughly cleaned. The seal for the window will be closely cut to the frame of the car. Then the frame and new car window glass will be cleaned for a smooth and strong seal. The sealant will be applied to the appropriate surfaces, and the glass will be installed in the frame, and it must be left to thoroughly dry. While this overview may make the installation of car glass seem simple, the devil is in the details. A professional and experienced glass installer is necessary for your safety, because of a piece of glass is not installed correctly, you run the chance of compromising the structural integrity of the vehicle. The Glass.net free car window and auto glass quote tool was made to empower people, just like you, to find the top quality replacement car windows, as well as certified installers. Using our obligation and cost-free quote tool, we give you up to 5 competing quotes in just 30 seconds. Those quotes come from our network of independent local glass shops, and include important information such as consumer-generated star reviews, the personal guarantees and warranties of the shops, if they accept insurance, what quality of glass they use, the installer certifications, and so much more. If your car windows have stopped protecting you as you drive, and instead turned into a hazard and hassle, use Glass.net to find out your options for replacing your auto glass, windshield, or car windows. Because with Glass.net, you always have a choice! Since you're already here, why not allow us to give you, up to 5 car glass price quotes from installers near you?